Today we were served with a summons to appear to in court over a patent lawsuit involving the Nintendo Wii. UltimatePointer claims the Wii violates their patents for a "method for controlling movement of a computer display cursor based on a point-of-aim of a pointing device". 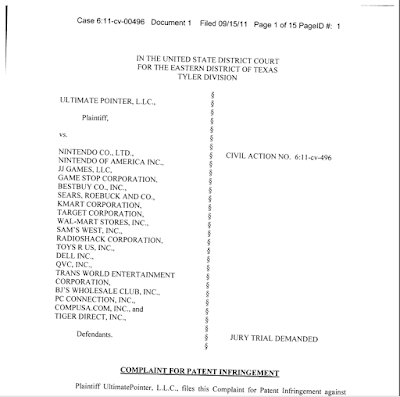 UltimatePointer sued Nintendo, JJGames, Best Buy, Walmart, Target, GameStop, Kmart, Sears, and more retailers for "using, selling, offering for sale, and/or importing the accused products" and for "inducing others (including end users) to use, sell, offer for sale" the Nintendo Wii. It is kind of flattering to be included in the same league as Walmart, Best Buy, and GameStop. Last year they had $422 billion, $50.3 billion, and $9.4 billion in revenue respectively. JJGames had a little over $1 million in sales during 2011. Walmart is the largest employer in the United States with 1.4 million employees. JJGames has 10 employees. How many Wii's do you think JJGames has sold in our history........241 and how many have we sold in the state of Texas where this lawsuit was filed? 12. And every single one of them was used. We sold twelve used Wii systems and we are being sued for patent infringement. This lawsuit might as well have included everyone in Texas who ever sold their Wii on Craigslist or eBay. Every single one of them is guilty of "offering for sale" the "accused product". Obviously I don't think UltimatePointer should sue everyone who bought and sold a Wii. That would be as successful as the music industry suing individual file swappers. A complete public relations nightmare. At least the music industry only tried suing users who had swapped more than 1,000 files. The RIAA's threshold for a lawsuit is 83 times bigger than UltimatePointer's. Hopefully this lawsuit is thrown out as soon as it arrives on the judge's desk. You can read the entire court filing here.